A bas-relief of the Horsemen of the Apocalypse on a tomb at the Limoges cathedral, Paris, France. People have been predicting the end times for centuries—are we getting close to a time when the predictions will come true? The endtimes are coming. Beware of false messiahs, ranting prophets, and the antichrist—and prepare to be taken aloft by the Rapture. To some Christians, the profound meaning of the New Testament is that Jesus Christ will return in the Last Days and prompt the resurrection of the dead and the Final Judgment. The heart of the gospels is eschatological, end-oriented. The essential theme of Jesus’s teaching is that the last stage of history, the endtime, was being entered into with his appearance on Earth. In Matthew 24:3–44, Jesus speaks to his disciples at great length concerning false messiahs and prophets who will deceive many people with their rumors about the end of the world. He makes reference to the prophet Daniel and his warnings concerning the endtimes and the antichrist, and he admonishes the disciples not to chase after false teachers who will produce great miracles and signs to trick God’s chosen ones. No one knows when the Son of Man shall appear again coming on the clouds of heaven, Jesus tells them, not even the angels. However, the prophets of apocalypticism believe that they have received visions that allow them to see ahead to the endtime and predict when Christ will return. Among the most famous of the endtimes prophets was William Miller, who founded the Millerite movement about 1831. Miller believed that he had discovered the exact date of Christ’s return by calculating two thousand years from 457 B.C.E., when Ezra was allowed to return to Jerusalem to reestablish the Temple. Based on his studies, Miller concluded that the Second Coming would transpire in 1843, although he later revised this prediction to include the period between March 21, 1843, and March 21, 1844. When the latter date embarrassingly passed without notable event, he refined his calculations and finally settled on October 22, 1844, as the day that Jesus would return in all his glory. The Millerites, who numbered at least fifty thousand, were dealt the “Great Disappointment” when Christ failed to arrive on that date either. Then one of Miller’s followers, Hiram Edson, had a vision revealing that the divinely inspired date had not been incorrect, merely misinterpreted. What Miller had seen, according to Edson, was the date when Jesus would begin to cleanse the heavenly sanctuary in preparation for the gathering of his earthly followers. Another follower, Ellen G. White, author of The Desire of Ages and The Great Controversy, had visions which told the Adventists, as some of the Millerites were now calling themselves, that they were God’s special endtimes remnant. She also concluded that they should begin to keep the original Sabbath, Saturday, as their day of worship. The Millerite apocalyptic revelations had evolved into the Seventh-day Adventists. Later, the Branch Davidian Seventh-day Adventists, seeking to reform the church, broke away and formed their own interpretation of Millerite doctrine. In the Jewish tradition, apocalyptic thought presupposes a universal history in which the Divine Author of that history will reveal and manifest his secrets in a dramatic endtime that with finality will establish the God of Israel as the one true God. The “end of days” (acharit ha-yamin) is bound up with the coming of the Messiah, but before his appearance governments will become increasingly corrupt, religious schools will become heretical, the wisdom of the scribes and teachers will become blasphemous, young people will shame their elders, and members of families will turn upon one another. Then, just prior to the arrival of the Messiah, the righteous of Israel will defeat the armies of evil that have gathered under the banner of Gog and Magog, and the exiles will return to the Holy Land. The world will be at peace and all people will recognize the one true God. With the advent of the Messiah there will come the great Day of Judgment in which the dead shall rise from their graves to begin a new life. During the period known as the World to Come (Olam Haba), the righteous will join the Messiah in partaking of a great banquet in which all foods, even those previously judged impure, will be declared kosher. All the many nations of the world will communicate in one language; the Angel of Death will be slain by God; trees and crops will produce fresh harvests each month; the warmth of the sun will heal the sick; and the righteous will be nourished forever by the radiance of God. According to ancient Jewish teachings, only the ashes of a flawless red heifer could purify worshippers who went into the Temple in Jerusalem. The First Temple was destroyed by Nebuchadnezzar in 586 B.C.E. ; the Romans demolished the Second Temple in 70 C.E. Without a flawless red heifer to sacrifice to purify the Temple Mount, the Third Temple could not be built and the Messiah could not come. In modern times, rabbinical law has forbidden Jews from setting foot on the Temple Mount and defiling the site where the Holy of Holies once resided. Fundamentalist Christians believe that after Jesus Christ has returned and defeated the forces of evil at the great battle of Armageddon, he will begin his millennial reign from the Third Temple. Muslims revere the Temple Mount as the place where Muhammad ascended into heaven; and in 685, followers of the Prophet began constructing the thirty-five-acre site known as the Noble Sanctuary, which today includes the Dome of the Rock and the al-Aqsa Mosque. Muslims believe that Jesus will return as a Muslim prophet and conduct the day of final judgment in the valley just below the Noble Sanctuary. A large number of Christians who believe in the endtimes also envision an event they call the “Rapture,” in which born-again Christians will be taken up into the air to meet Christ. Many believe that the Rapture will happen unexpectedly. Those Christians of special merit will be lifted suddenly from their homes, their automobiles, even from their passenger seats on airliners. Most of humankind will be left behind, including those Christians whose faith requires strengthening. To fundamentalist Christians, the Rapture will be a literal, physical occurrence, rather than a spiritual transformation. Those who are taken up by Christ may leave their clothing on the streets and their cars crashing into trees, but they will be lifted body and soul into the sky. 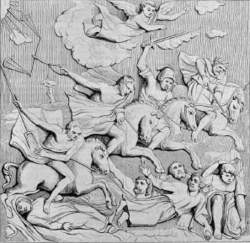 Although Christians who believe in the Rapture are certain that it will occur in association with the time of Tribulation (the seven-year period of disasters, famine, and illness during which the antichrist will be in power), opinions differ as to whether it will come about just before the Tribulation begins, midway through the seven-year reign of the antichrist, or at the very end of the Tribulation. There is, however, general agreement that when this awful time of lawlessness and corruption has passed, Christ will return to Earth with his army of angels and destroy the forces of darkness at Armageddon in the final battle of good versus evil. Babylon, the False Prophet, and the Beast (the antichrist) will be dispatched to their doom, and Satan, the Dragon, will be bound in a pit for a thousand years. With Satan imprisoned and chained, the Millennium, the thousand years of peace and harmony, will begin. Not all Christians accept the scenario of the Rapture, but many Christians and non-Christians alike find the premise intriguing and read the books in the Left Behind series as exciting science fiction. Authored by fundamentalist minister Tim LaHaye and professional writer Jerry Jenkins, the twelve books in the series, based on the events of the Rapture, have sold an astonishing 65 million copies. In addition, a complementary Left Behind series of thirty-four titles for children has sold 10 million copies. Related computer screens, calendars, board games, and collectibles have also sold in the millions. From 1958 until his retirement in 2011, Christian broadcaster Harold Egbert Camping (1921–) was president of Family Radio, a California-based radio group that broadcasts to 150 markets in the United States. Camping sometimes applied numerology to his interpretation of Bible passages that he believed predicted the endtimes. In 1988, Camping prophesied that the end of the world would occur on May 21 of that year. Undaunted by the sunrise on May 22, Camping went back to the Bible and his numerological computations, waiting until 1994 to make another doomsday prophecy that the world would end on September 6 of that year. Somewhat chastened by another miscalculation, Camping was content to remain a fiery Christian broadcaster until his Bible interpretations moved him to receive another prediction for 2011. This time, he worked in some elements of the Rapture that were popular with certain evangelicals. On May 21, 2011, he predicted, Christ would return to Earth, elevating the righteous to Heaven. For all others, there would follow five months of terrible plagues on Earth, killing millions of people each day. His predictions for 1988 and 1994 had come and gone without gathering too much notice, but Family Radio was more media savvy by 2011, and they launched a massive publicity campaign that brought international attention to Camping’s prophetic utterances. Major media outlets carried stories that announced the approaching Judgment Day to believers and skeptics alike. When May 21 left thousands of true believers disillusioned and even more unbelievers amused, Camping defended his power of prophecy by proclaiming his revelation that a great spiritual judgment did occur on that date and that the great physical Rapture would happen on October 21. But the responsibility of serving as an Apocalyptic spokesperson proved too much for Camping and he suffered a stroke in June. On October 16, 2011, he retired from his presidency of Family Radio. When October 21 once again came and went without people rising to Heaven and the physical universe being destroyed, Camping conceded in a private interview that he guessed no one could know the actual time that the world would come to an end. RAIL: I'm interested in the American notion of time, especially that of apocalyptic millennialism, which your book refers to by being set in 1999.